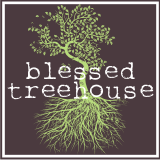 Blessed Treehouse: I am. Blessed. I am mom to a darn cute lil' man (who turns three in April), and a darn cute lil' gal (who turned one in August). Speaking of darn cute, so is my husband, Matt. And, so is our yellow lab, Jaeger. Together, we live in the 'burbs though there is a piece of the country alive in our hearts. God continues to bless us beyond our dreams. I didn't even know you had this other site Ali. You are an amazing young woman with more wisdom than you realize. I see great things coming from your life and your family. God's blessings on you!